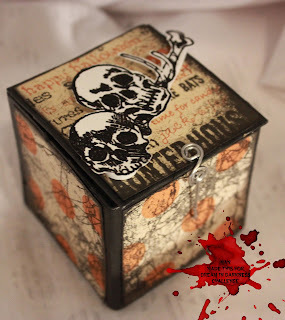 It is down to day 22 of the 31 Days of Halloween hosted by Smeared Ink! We are joining the other Wicked Bloggers listed on the side bar and showing you something new every single day! Check out their blog for rules and details. It is my turn again to show you something new. And it is a box. Yep, a box. It is a rather nice box. It has a stamp from the "Morte" set from Smeared Ink embossed in black on top. Some nice papers and the orange polka dots are stamped with "The Grunge Tree" from Lost Coast Designs. It does have a wire clasp as if to keep us out or something in? Oh, now I remember why I needed that clasp! Just my pet zombie hand popping out to say hello to all you visitors to the house. The only really scary part is that if this zombie hand touches water it grows and grows! So he stays in his box wrapped in velveteen far away from the water. So bye bye for today from me and my pet zombie hand! But don't forget our challenge is still going on so come by and drop off your entry! Great project love the box and the zombie hand is a great effect. Love the surprise if you open the box. Fabulous box! Would like to see someone's face if they are not expecting the surprise! Ha ha! Love it! 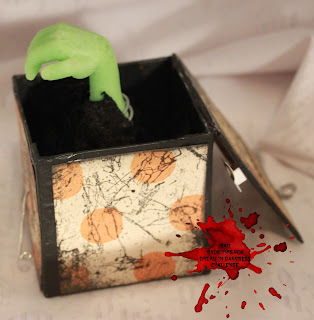 The box is so cool, and the zombie hand is awesome. Bwahahahaha, I love it pet zombie hand and all! FABOOLOUS box!!!!!! 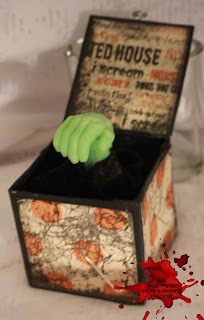 LOL... who would have thought.. a pet zombie hand that need to be kept in a AWESOME box... love the skulls! Thanks for sharing!! !